Me, Myself and Crohns Disease: Hmmm. I so badly want to move on from all this. I love my family to pieces but they're my constant company now as all my 'friends' were crap and ditched me when I was at my sickest. I've kinda lost faith in people and myself. I don't feel like me anymore. 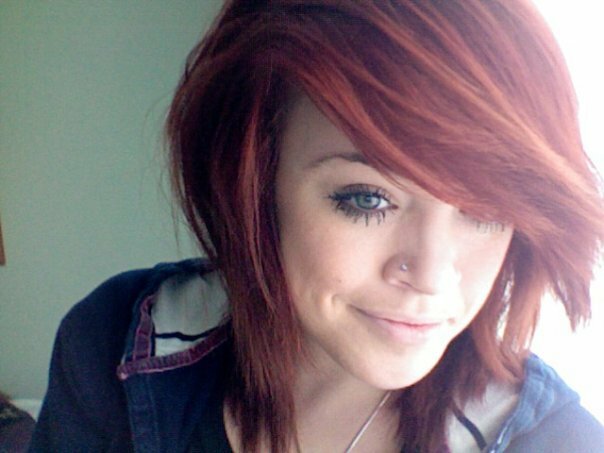 The old me had bright red hair. Was incredibly over confident, loud and mouthy. Wanted to be centre of attention all the time. And would dance in a room and wouldn't care if people watched. The new me, finds the thought of that so scary. Yep, that was me! Crohns skinny too.. But I felt to confident with red hair! I now have my natural hair colour as all the dyed hair grew out! So thats one part of me gone! I'm thinking of putting a blonde coloured bit in my hair. In attempt to 'me' myself again. As my hair has natural blonde highlights I wanna keep it natural-ish. I don't really understand the point in this post, and it's probably wasting your time reading it. But it helps me to rant it all out. This is effectively my diary so prepare for rubbish like this! I'll give y'all the title. That's totally the same for me! i'm a total hermit now! Thank you, I will totally hang in there. Just hard to see a way out at the moment! It's so good that you can go out now with your son! Bet it makes it all worth while :). Hi....so glad I found you here....I was just recently diagnosed with Chrones....happened after my colonoscopy....couldn't stop throwing up...was hospitalized.....and that's when they diagnosed me.....here is the weird part.....I have pretty much all the symptoms...losing weight, going to the bathroom all the time...stomach pain all the time.... had 4 doctors all tell me it's Chrones....then my GI doctor wanted to do a 2nd colonoscopy....and a second scan ...the one that they take pictures every 15 minutes....the GI doctor didn't tell me anything about the scan..but the doctor who looked at the end of the test told me it was Chrones...after the colonoscopy....the GI doctor told me he doesn't think I have Chrones...he thinks is IBS....I was diagnosed with IBS 7 years ago...this is different for sure! So confused.... I think I am leaving this guy and going to another GI doctor.... not that I wouldn't be thrilled if I don't have Chrones....but he didn't stop the 20 pills he gave me to take...which definitely make me feel a little better.... did anyone ever do this to you? Is this common????? I was handling things really well...I was diagnosed with Sarcoidosis 20 years ago....so I am used to the crazy auto immune things.... just weird that a doctor would change his mind when other doctors tell you what you have....but didn't change medications.....Is it possible that I am just at the beginning stages and he isn't seeing what I'm feeling???? If you have an opinion...please let me know.....It took 8 months for them to find the Sarcoidosis ... the not knowing for sure part is the worst..... As far as you are concerned....I am older than you (for sure).... do what makes you feel good about yourself...and get back to things you enjoy.....I am a "positive" thinking person.... won't let anything get me down or stop me from doing what I want to do..... if you can't get out of the house...find something you enjoy doing in the house....I started making cat toys and selling them on ebay....keeps me busy and my mind off of things I don't want to fixate on.....Hope you write back! Hi Gibbsayy...and everyone else....I did some research on line yesterday...and my hubby talked with someone who said that my GI doctor could be right....some people get infections that mimic Chrones....so I was very positive last night "hoping and wishing" the doctor is right...seeing him Wednesday.....then...woke up in the middle of the night...diarrhea, vomiting.... I still have the rash all over my body that looks like a bad sun burn (sun reaction to Asocol I think)....swollen glands... so....needless to say....I'm thinking the doctor is getting this wrong....I scheduled another GI appointment on Friday with another guy to get a second opinion. The GI doctor also mentioned IBS...but I was diagnosed with that over 5 years ago....and the attacks are different! So....I'm itching....afraid to eat anything.... exhausted from not sleeping... keeping myself buys making cat toys which I sell on ebay....I have about 20 pieces I have to get done over two days....and really don't feel good enough to stuff the stockings with the catnip.... needless to say....not a good day! I did have a ton of blood work done....the doctor called and canceled my appointment ...so I will probably find out what the results are when I see the GI doctor ad I asked them to send him a copy. I really just want a definitive answer as to what I have.... and what I am supposed to do when I have an attack like last night... my poor hubby gets so panicked when he hears me in the bathroom....I'm trying to stay positive...but it's so hard when you don't know for sure what you have.... the not knowing makes you crazy! It took a slew of doctors 8 months to find that I have Sarcoidosis....the stress was horrible....I have been on Prednisone for 20 years.... I have kept my weight under control...but the moon face is inevitable...the GI doctor wants me to be totally off the prednisone...my pulmonary doctor says no..... I will have an Sarcoidosis attack.... getting it from both sides..... Hopefully this week I will get some answers....or I will keep going to different doctors until we find out for sure. My hubby wants me to go to Phili...but that's over an hour ride....and then you don't have a GI doctor around the corner..... so I am fighting that.... Just saw a commercial for the first time about Chrones....they gave a web address...I think it's knosknonestv.com...I will check it out.... Thanks for writing Amy!